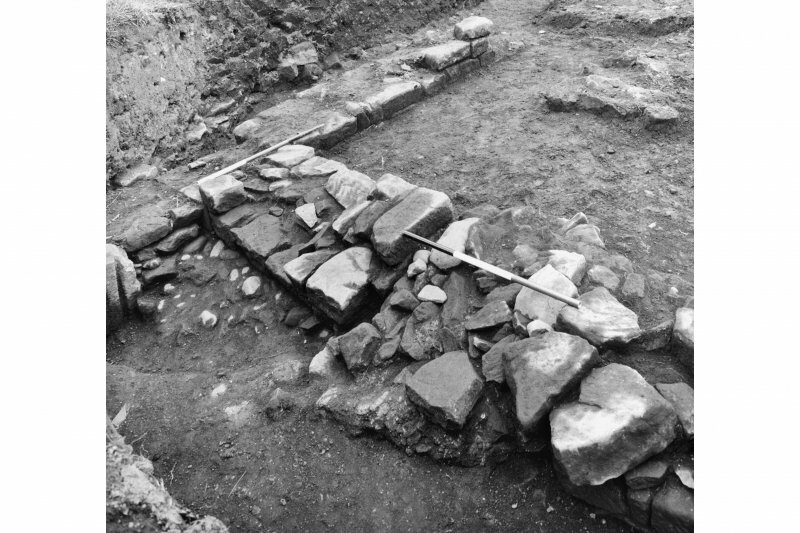 Excavation photograph showing the buttress of wall of second century granary or stone building. Block B. Tank below floor level at W end. 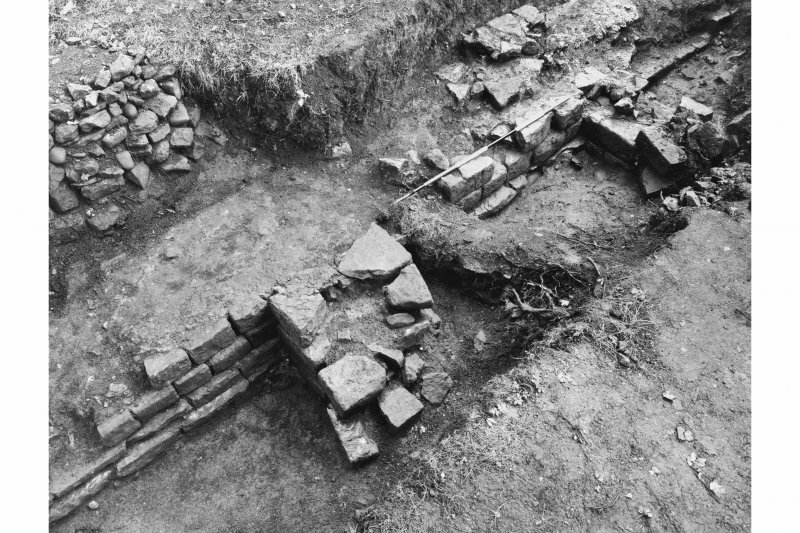 Excavation photograph of the E gate with an inverted gutter and possible foundations of the guard chamber. Principia. Base of portico pillar. 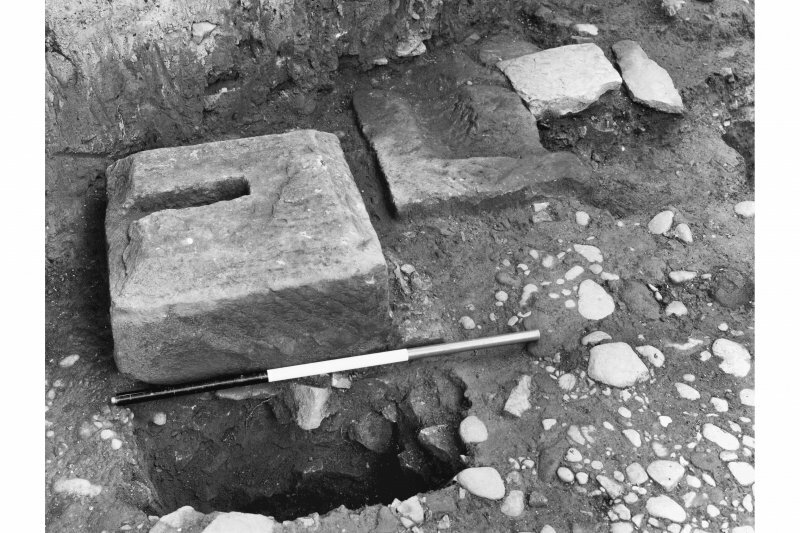 Excavation of Block B - W door with blocking in situ. See also NT17NE 77 (trenching at NT 189 769). For trial excavations in Cramond Inn car park (NT 1897 7705), see NT17NE 87. For Cramond 'lioness' (found at NT 1890 7702, but first published as being from the fort), see NT17NE 211. For discoveries around Cramond House, see NT17NE 34.00 and NT17NE 34.02 . For (2005) watching brief (NT 193 767 to NT 193 770), see NT17NE 287. Cramond Roman Fort (see RCAHMS 1929 plan, fig.3) encloses just under 5 acres; a civil settlement lay outside the E rampart. Excavations 1954-66 showed that it was first constructed about 140 AD, with a second Antonine occupation. There was a third occupation under Severus, with extensive reconstruction along existing alignments. Some use of the fort (probably civilian) with minor building in a Roman manner also took place in the post-Severan period which may be associated with a little 4th c pottery. The civil settlement was occupied during all four phases and yielded some 1st century coins, but if there was an Agricolan fort at Cramond, no trace of this has been found. Inscribed stones which may be attributed to the fort are a centurial stone of Legio II Augusta (RIB 2137): an altar "To the Alatervan Mothers and the Mothers of the Parade-ground" erected by a cohort of Tungrians (either first or second) at the instance of a centurion of the Twentieth Legion (RIB 2135): and an altar "To Jupiter, Best and Greatest" erected by the fifth cohort of Gauls (RIB 2134). Rae gives a full description of the pottery, coins, etc found during the excavations. Material from the fort is in the NMAS and Huntly House Museum, Edinburgh. The part of the fort now owned by the City Corporation has been laid out as a public open space in which the outline of buildings, rampart and gate appear against a background of grass, and in which a stretch of Severan wall has been conserved by the DoE. A Rae and V Rae 1974; RCAHMS 1929; G Macdonald 1918. An emergency excavation immediately S of the fort revealed traces of masonry and cobbling in an area where a civil settlement would be expected. Tiles, Roman pottery, and a Severan coin were also found. NT 191 767. 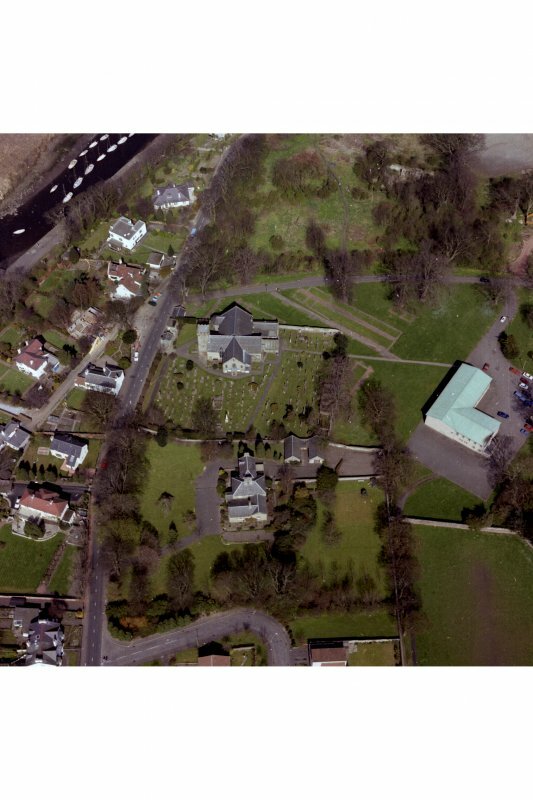 Two areas of the southern walled garden of the manse were investigated. A quantity of Roman tile, amphora and pottery fragments were recovered, mostly in an abraded condition, as well as one Roman coin, but there were no identifiable structural remains datable to the Roman period. It seems clear, therefore, that the vicus did not extend this far to the S.
NT 190 769. An attempt was made to locate the position of a N ditch of the fort by means of a machine cutting. No trace was found. NT 190 770. 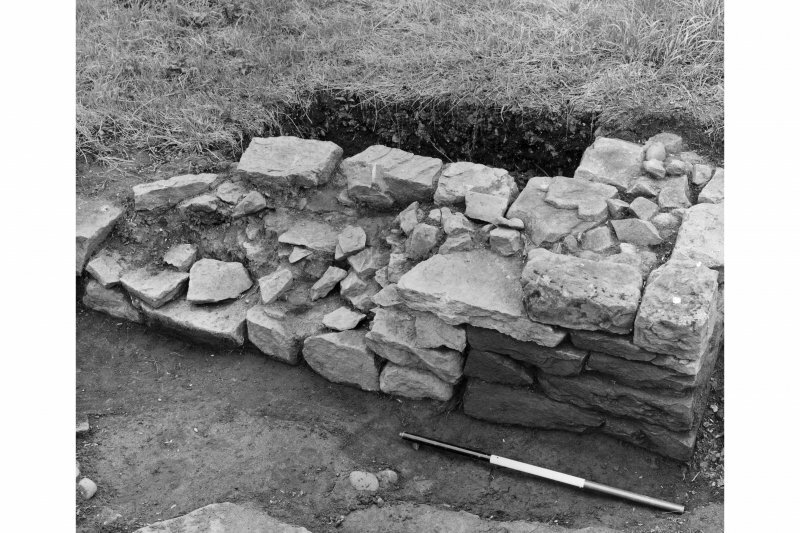 Part of a Roman building was revealed during ground clearance for the construction of a car park S of Cramond Inn. Excavation showed the structure to be fairly extensive, and further work will be required to determine its complete ground plan. The walls at the W end survive to a height of over 1.5m from foundation level but elsewhere some stretches of the wall have been completely destroyed. The area so far excavated contains the remains of at least two hypocausted rooms, and the enormous number of broken flue-tiles removed suggests that the building was a bath-house, but so far no distinctive features have been discovered. The structural remains are clearly of at least two phases, and the small amount of stratified Roman material so far recovered suggests that these date from the Antonine period only, but one coin from the lowest of the disturbed levels is of Severus. Information from Discovery and Excavation, Scotland Ms 1975. The part of the fort marked out on the ground is as described but there are no surface indications of the remaining extent. No further information was obtained regarding the finds to the S of the fort. The excavation S of Cramond Inn is centred at NT 1901 7701. Excavations previously reported were completed in 1986. In addition to the road leading SE from the East Gate, a foundation-trench and post-holes for timber buildings of Antonine and Severan date were noted. (NT 189 769) Exploratory trenching continued to the N of the 1988 excavation. Traces were noted of a late trench, possibly one dug by A and V Rae during the fort excavations in the late 1950's. shells extended across the N end, after which the drain's sides had been crudely rebuilt with rounded boulders. The capstones were missing at this point, and the drain was overlain by the N clay surface. Glass and pottery from the trench indicate an 18th century date for the building remains, and iron slag may indicate some minor industrial activity. Vast quantities of shells of many varieties indicate the scale of local consumption. (NT 189 769). Excavation of the post-medieval building remains and rubbish pits, revealed in 1988, was completed. 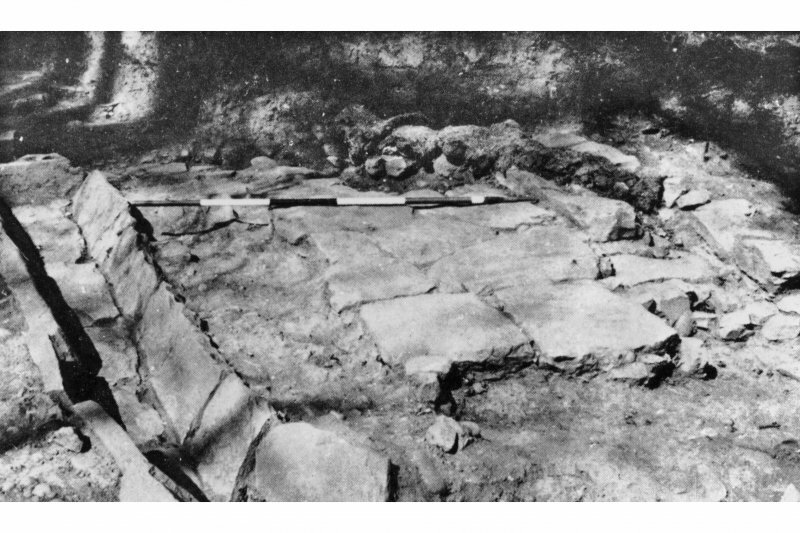 A possible grave lay beneath the floor slabs. Indications are that the fort rampart had been removed; the underlying clay was found to be natural. Further work was done on the second building and drain (noted in 1989). More immense boulders were revealed, revetting the W side of the drain. These were overlain by dumped stone and shell, apparently as levelling for the drain's later phase; this contained pottery ranging from Roman to post-medieval green-glazed ware. (NT 189 769). Work continued on the exploratory trench (noted in 1988, 1989 and 1990) which ran parallel and 7m W of the still-visible Roman gutter on the W side of the road through the N gateway of the fort. To date, the trench has extended to 23m N of the outer face of the N rampart as shown by A and V Rae. No trace has been found of a fort ditch which might have been expected to the N of the fort. An as of Domitian (81-96 AD) was retrieved. unknown date had been built into the drain's sides. Sponsors: Edinburgh City Museums and Galleries, Edinburgh Archaeological Field Society. (NT c. 190 769). 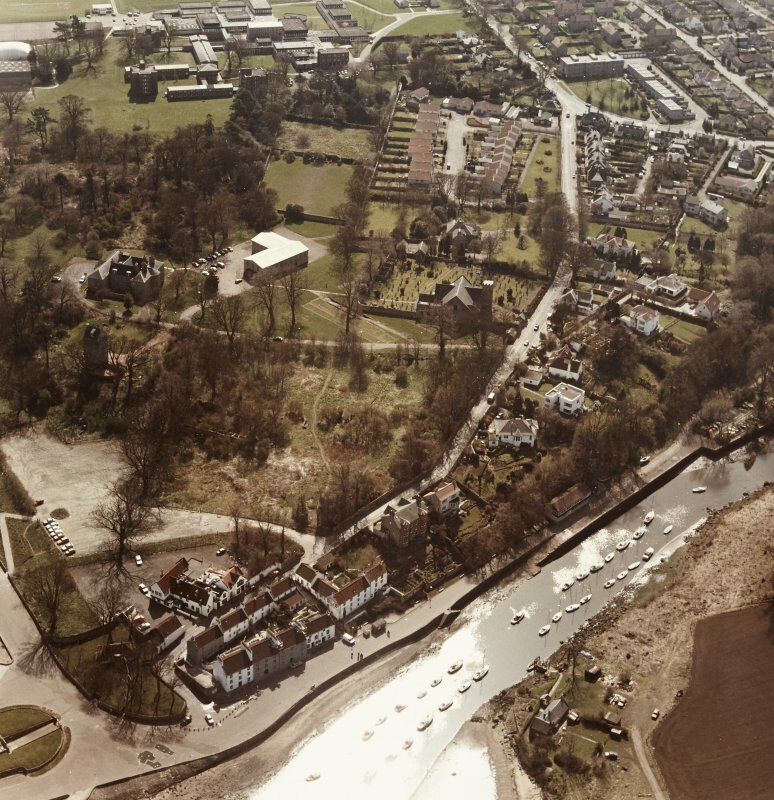 Three trial trenches were opened within the perimeter of the fort's defences in advance of the installation of a new service pipe trench to Cramond House. Trench 1 (NT 1894 7687) was located on the northern edge of Kirk Cramond roadway, on the projected line of the western wall of the granary building, previously excavated to the south of the modern road. A rubble layer was encountered, probably the levelling for the road. Below this was a surface of compact mortar set with stones, suggesting either a arbbled surface, or perhaps the core of a rubble-filled wall, possibly of Roman date. This lay below the depth of the new service trench and would not be damaged by it. Trenches 2 (NT 1897 7688) and 3 (NT 1902 7691) both contained material deposited as levelling for the modern road. Sponsor: DM Hall (Chartered Surveyors). NT 1895 7685. Excavation of new footings for the old mortuary house in the NW corner of the kirkyard uncovered a 5m length of Roman granary wall, a continuation of the structure excavated immediately to the N by Alan Rae (Britannia 1974). The wall had been robbed to the course above foundation level in most places. It was constructed of a mortared rubble core with squared sandstone facing blocks. The main body of the wall was 0.9m wide with a single offset foundation course projecting on both sides. Two buttresses on its E side were recognised: both had been badly damaged by robbing. A vent ran through the wall width between the buttresses. After recording the wall was reburied. Above the wall a depth of 1.3m of dark humic loam to modern ground contained many disarticulated human bones. No intact skeletons were observed. NT 1899 7696. The exploratory trench in the area N of the Roman fort is now 38m N of the outer face of the N rampart and still without trace of a fort ditch. The subsoil comprised glacial till, giving way to yellow clay with an overlying deposit of water-lain sand, into which had been cut a number of small pits. Several of these contained Roman pottery, but also a little post-medieval pottery. Overlying the pits was one of two spreads of dumped stone, shell and bone, on top of which were the remnants of clay and cobble surfaces and mortar patches. Pottery within the dumps was predominantly early post-medieval green glaze, whereas that in the demolition layer above was largely 18th century material. 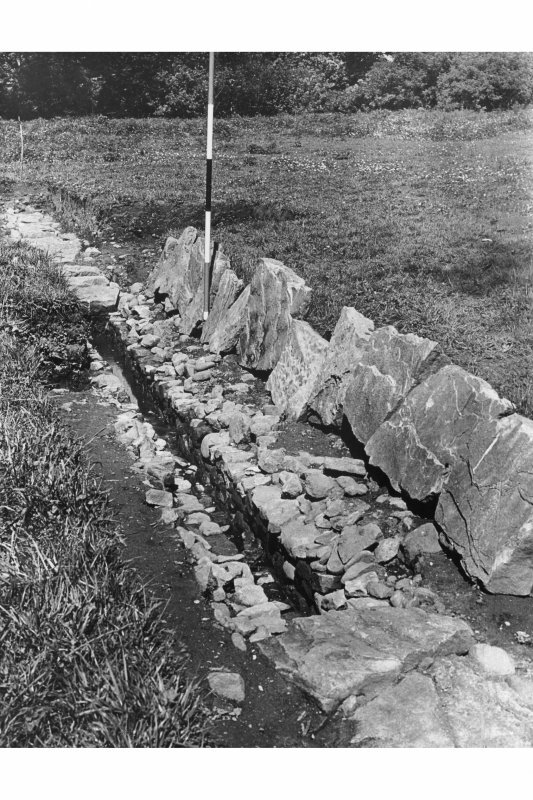 A further short stretch of stone-lined drain was noted, similar to that previously reported. Its projected line would join the other at approximately 125 degrees. Many of the side and packing stones were re-used, with considerable amounts of mortar adhering to them; post-medieval pottery was contained in its fill. Sponsors: City of Edinburgh District Council, Museums and Galleries; Edinburgh Archaeological Field Society. NT 1899 7698. Northward extension of the exploratory trench between the Roman fort and bathhouse revealed a possible entranceway to the W side of the mid 19th-century kennels building of Cramond House. The building has been cut into the edge of the 15m raised beach, necessitating steeply ramped access routes to the S and W. The above path consisted of a compacted surface of mortar and sandstone chips overlying steep tips of mortar and stones, not yet bottomed. This was bounded on the N by a length of curved walling and parallel drain, which overlay a very substantial clay-bonded wall, 1.1m wide, running E-W, whose large, squared, re-used stones bore traces of mortar. North of this, another wall, running N-S, and consisting of at least three courses of mortared stones of assorted shapes, appeared to have been deliberately collapsed to the E into a trench dug, through the clay-bonded wall, to receive it. This building had an outer rendering of ochre-yellow mortar, with an inner blue-painted plastered wall. No dating for these walls is yet available. Sponsors: City of Edinburgh District Council, Archaeology Service; Edinburgh Archaeological Field Society. Excavation revealed the poorly preserved metalling of a road leading S from the S gate, and the W side of a ditch 2m wide and 0.95m deep, orientated N-S. This ditch, not aligned on the known fort defences, could belong to an earlier (Flavian?) installation. NT 1899 7698 The clay-bonded wall previously reported (Dean 1994) and running W-E was found to turn sharply to the N; traces of it extended for 1m. It had been badly damaged by later activity and most of its stones removed. In the trench to the S, the compacted layer of mortar and sandstone chips was found to be the upper fill of a large circular pit, 3m in diameter and at least 1.3m deep, which was not bottomed. It was filled with successive layers of mortar and stone. At the N and S sides, it had cut post-medieval midden pits; these had apparently then been revetted with banks of clay and boulders. 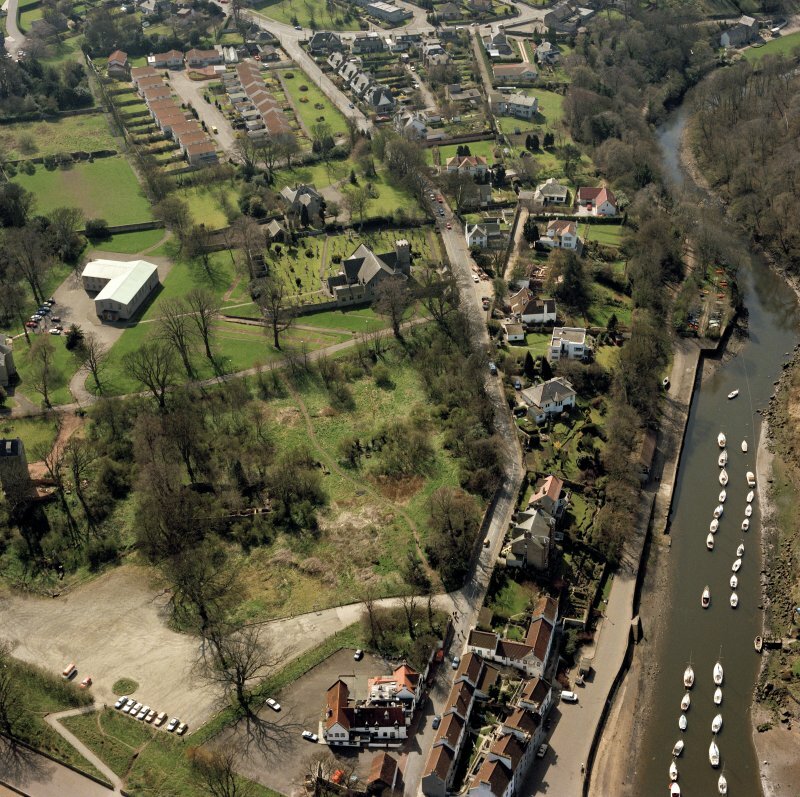 As the lower sides revealed the sand of the 15m Late Glacial raised beach, the pit may have been a sand extraction quarry related to the building of the adjacent mid-19th-century kennels. Sponsors: City of Edinburgh Council, Edinburgh Archaeological Field Society. 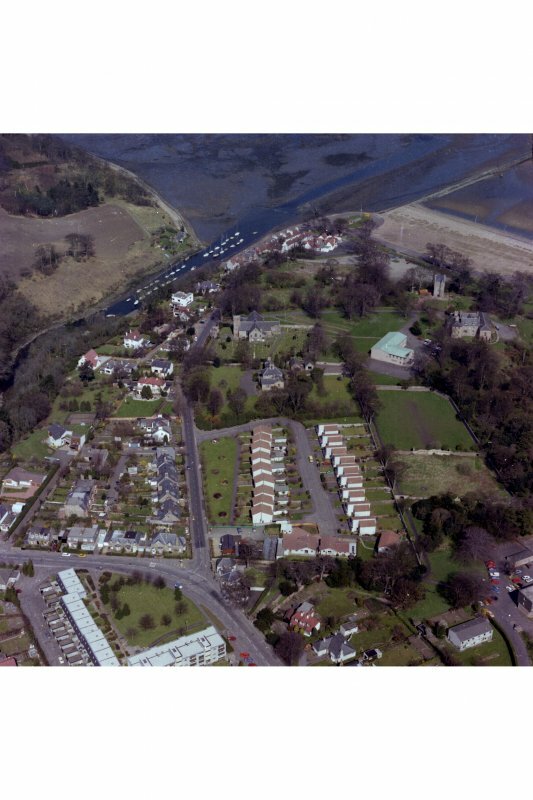 NT 1908 7684 During October 1998 Headland Archaeology Ltd were commissioned by Smith Scott Mullan & Associates on behalf of Cramond Kirk to investigate the survival of archaeological remains within the proposed site of the extension to Cramond Kirk Hall. 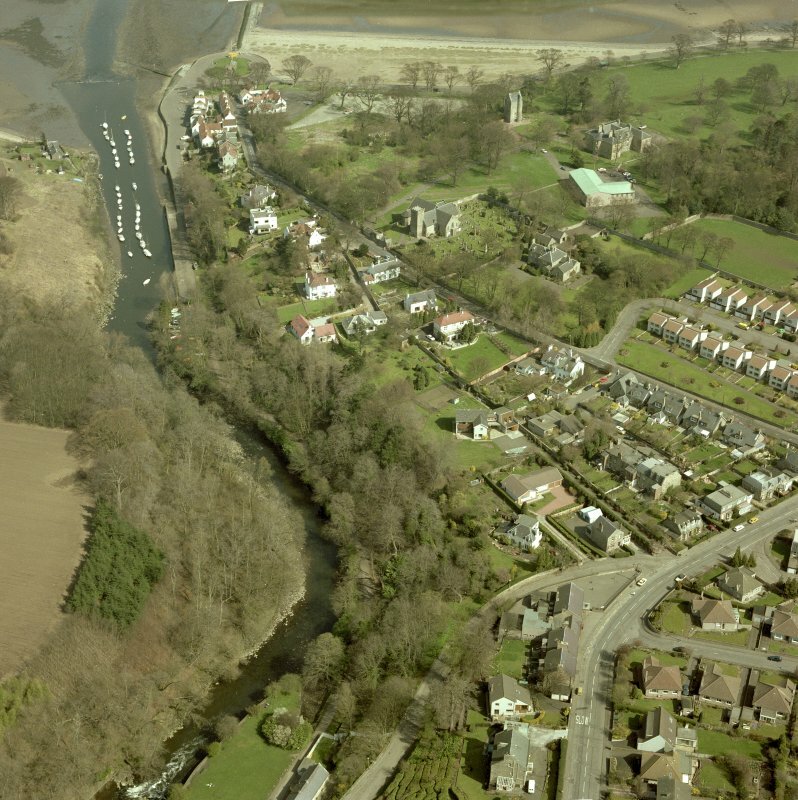 The site lies within the Scheduled Ancient Monument area of Cramond Roman Fort. According to previous excavations the proposed development site lies outside the E gate of the fort within the civilian settlement area. Three archaeological trenches were dug. Trench 1 across the development area on the E Side of the Kirk Hall and trench 2 & 3 close to the W elevation of the Hall. Two smaller trenches were also dug to allow the architects to locale service pipes and cables. Trench 1 uncovered a N/S aligned ditch, which is not parallel to the forts eastern Defences. This supports evidence found in 1995 suggesting the existence of a previously unknown Flavian Fort or possible Roman marching camp. Trench 2 revealed Roman road cobbles, which the report suggests, belong to the road leading from the E gate of the fort. Evidence shows that the road was reused many times, however further examination is needed to fully understand its history. The trenches also revealed some evidence of more recent building work related to an old stable, which was previously on the site of the Hall. The report argues that these remains are of some importance and Historic Scotland, prior to any development will insist a mitigation strategy for their avoidance or excavation. NT 1899 7698 Two further studies have been made to the W of the trench in which a length of mortared stone wall was found (DES 1997, 32); these have extended to the W and S of the survey reported previously (DES 1999, 36). The first was an area survey that showed higher resistance to the W of the previous survey and cast doubt on the likely continuation of the wall suggested in DES 1999. Seven linear array measurements (three E-W and four N-S) show a broad high-resistance ridge some 3m N of the wall line. At a depth of 1.5m, the ridge is at least 14m long and is most likely to relate to debris of a house in Old Street demolished in 1826. A metal-detector survey prior to the resistance measurements produced a section of a ?lead seal. Sponsors: Edinburgh Archaeological Field Society, University of Edinburgh - Dept of Geology and Geophysics. NT 1899 7698 The function of the stone-lined pit previously noted (DES 1999, 36) cannot be confirmed as a kiln, due to the lack of a stoke-hole, although signs of burning were evident. Its base comprised a worn, square-socketed millstone in a stone setting; a coin tentatively identified as a turner of Charles I (1642-50) was incorporated in the stone lining. The cobbled Old Street of Cramond Village (DES 1997, 32) overlay a substantial build-up of stones and midden material. It was not possible to date the massive clay-bonded wall (DES 1996, 38). With the exception of a small pit which yielded Roman boot studs, no feature appears to be earlier than the later medieval period. Sponsors: City of Edinburgh Council Archaeology Service, Edinburgh Archaeological Field Society. NT 1900 7701 The series of trial trenches, begun in 1988 (DES 1988, 18) to provide a stratigraphic link between the N rampart of Cramond Roman fort (NMRS NT17NE 3) and its bathhouse located some 100m to the N, was concluded in 2001 when part of the SW corner of the clay-bonded furnace room was briefly exposed. The visible section was in good condition and appeared to be stable. The final length of trench had entered an area of backlands lying to the NE of the former village, destroyed in 1826. The only further feature noted was a trench containing a 2" cast-iron pipe, probably for water. NT 1894 7698 A brief examination was made of a previously noted well (DES 1990, 29), and the upper stonework was recorded. In plan, the upper part of the well is D-shaped with the straight section on the northern side. A lintel-type stone bridges across the well, below which the wall appears to be circular in plan; this suggests that a modification had been made to support a pump. Nearby, a 1m long stone was found which has a semi-circular notch cut in one long edge and the remains of four iron brackets on its upper surface. A pump could have been mounted on this stone, which would have fitted comfortably across the top of the well. The OS 25" map of 1895 shows a pump at this location. Probing indicated that the depth of the well is in excess of 2.5m; the lower 0.5m appeared to be damp. NT 1899 7698 An area ground-resistance survey was made approximately E-W from the side of previously excavated trench G across to the wall abutting onto Glebe Road. Undergrowth and trees limited the survey area to 384m2. High resistance appeared on the N side of the survey, which appears to relate to buildings shown on a vennel running W off Old Street on the 1815 map. High resistance at the end of the vennel equates to paving round the still open well. This area is to the W of the linear array survey previously reported (DES 2000, 33). Sponsors: HS, Edinburgh Archaeological Field Society, City of Edinburgh Council Archaeology Service. NT 1898 7702 An archaeological watching brief on the machine-excavation of a 35.6m long cable trench located immediately within the northern boundary of the Scheduled area of Cramond Roman fort failed to penetrate beyond modern made ground, and therefore failed to encounter either significant archaeological features or artefacts. NT 1908 7685 An archaeological excavation was carried out in advance of the construction of an extension to the kirk hall. 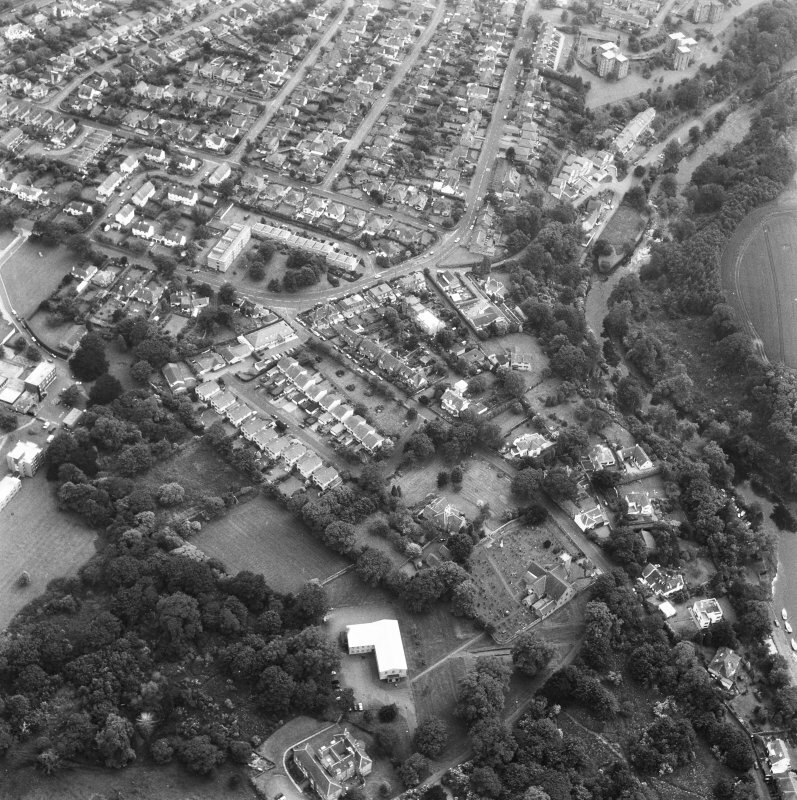 The site lies within the Scheduled area around Cramond Roman fort. The excavation uncovered a previously unknown third defensive ditch around the Antonine fort and a series of pits, drains and other linear features probably associated with the Severan reoccupation of the fort in the early 3rd century AD. In addition to the Roman features, a large pit of medieval date was uncovered in the N end of the site. Full details lodged with the NMRS. Sponsor:	Smith Scott Mullen & Associates for Cramond Kirk. NT 1910 7675 An area ground resistance survey was made within the N walled garden and on a small grassed area between the garden and the church hall. This is the area on which some of the fort vicus is assumed to have existed. A linear low resistance about 4m wide runs adjacent to the W wall of the garden, continuing on to the area to the N; this aligns approximately with a path shown on the 1893 25 inch OS map. A linear high resistance runs parallel up the middle of the garden and another, less clearly defined, alongside the E wall; these align with smaller paths on the same map. A curved high resistance line on the grassed area could also align with an 1893 path. The high/low differences between these paths cannot presently be explained, nor can the smaller high resistance strips to the E side of the walled garden. Sponsors: HS, City of Edinburgh Council, Edinburgh Archaeological Field Society. NT 1910 7675 It was thought that the lack of Roman features found in the previous survey (DES 2002, 47) could have been due to the ground having been made up to a depth that the survey could not detect, i.e. exceeding 0.75m. Two linear array measurements were later made that detected to a depth of 4m. The first was E-W across the walled garden and showed only the geology. The second ran NW from the grassed area N of the walled garden and recorded low and high resistances in positions that suggest the detection of the two ditches, the wall and building within the fort. Sponsors: HS, City of Edinburgh Council, University of Edinburgh - Dept Geology & Geophysics, Edinburgh Archaeological Field Society. H M D Jones 2003. NT 192769 An area ground resistance survey was conducted on the parkland to the E of Cramond House. It comprised 23 squares of 20 x 20m, and extended 120m to the E and 100m at its widest point. The most northerly row of six squares extended just over the edge of the old raised beach level. High and low resistance lines, running parallel to the tree avenue that frames the view of North Berwick Law from the house, suggest that a formal parterre garden was associated with the original house, built in 1680. Lines and rectangles that cross the parallel lines appear to be at right angles to the Roman road out of Cramond fort. Resistive linear array measurements across a low resistance line that runs along the edge of the raised beach on the area survey appear to show a ditch 2m wide and 2.5m deep, with possible upcast on the seaward side. This is very similar to that shown on a previous section across the inner ditch of the fort. Magnetometry results are still being analysed but do not show major features associated with resistive anomalies. Sponsors: HS, Cramond and Harthill Estates, University of Edinburgh - Dept Geosciences, Edinburgh Archaeological Field Society. works was undertaken between April and June 2005 on linear groundbreaking works associated with proposed pipe-laying connected with residential and leisure development. The works consisted of three elements: topsoil stripping and excavation, a watching brief, and the monitoring of the Scheduled area to the NE of the fort. The topsoil stripping and subsequent excavation revealed the continuation of three large Roman ditch features recorded during recent excavations, together with a further outlying ditch feature. A number of linear cut features and a pit of unknown date were also recorded, as were two boundary walls of probable post-medieval date. The watching brief phase uncovered a 23m long section of Roman road, aligned NW-SE, which also appeared to show continued use throughout the medieval period. A number of small finds, consisting of Roman and medieval ceramics and several iron and copper objects, were recovered from the ditch features and road. NT 192 769 Ground resistance and magnetometry survey (DES 2004, 53) was augmented by further magnetometry, with readings taken at closer intervals. Lines of magnetic anomaly correlated both with the resistive linear 'garden' features aligned on North Berwick Law, and with those on the Roman alignment. Some isolated significant magnetic anomalies, c 2m square, could represent kiln and metalworking sites in this NE vicus area of the Roman fort. Sponsors: HS, Cramond and Harthill Estates, University of Edinburgh, Dept Geosciences, Edinburgh Archaeological Field Society. NT 1906 7695; NT 1896 7695 A ground resistance survey of three 20 x 20m squares was made in the area to the E of Cramond Tower to see if the ditch, detected as a low resistance along the edge of the raised beach (DES 2004, 53), continued to the W and linked with the known Roman ditch at the tower pond. A low resistance, c 3m wide, was found to curve to the S to encompass the pond. The curvature was such that the ditch could be seen as a continuation of the N-S ditch on the E side of the fort rather than forming a T-junction onto the side of it. The second survey, 100m to the W of the first, comprised a 40 x 40m area, with its N edge parallel to and 15m N of the fort wall and set to cover the N exit from the fort. The Roman gutter on the W side of the exit was recognised, and a 5m linear high resistance continued this line to the N of the fort wall. The survey found no indication of the wall. Low resistance lines are likely to relate to previous excavations. Sponsors: Mr Eric Jamieson, Cramond Tower, City of Edinburgh Council, Edinburgh Archaeological Field Society. H M D Jones 2005. Cremation found while ploughing in field near Cramond more than 800m from shore. Found standing upright, covered by flatstone, contained burnt bone. Cobbled road surface between churchyard and stables. Aligned approximately from back of Manse to Tower. 16/17th century pottery. Trench cut by British Telecom through east pavement of Glebe Road on point of bend revealed only yellow clay - no topsoil. Timber buildings and drain uncovered. some significance that among the finds were two pieces of tile with criss-cross grooving and a fair number of gaming pieces of various materials. Amounts of Roman material were generally very small. Pottery dating from approximately the 14th century was found lying directly on the floor of the well-preserved cold plunge-bath and in the latrine were the remains of eight or nine humans buried together in considerable disarray and associated with the upper part of a cooking-pot of 14th century type. Elsewhere extensive robbing of building stone had taken place in the 17th century. of the heel of a ditch was found. The only Roman period evidence comprised two amphora sherds. Further excavation and enlargement of this site proved that it was part of the Roman "vicus". A number of linear ditches, representing timber buildings and containing quantities of burnt daub, were associated with several pits and a well some 3.5m deep. Amounts of leather suggested that leather-working and tanning had been carried out. Excavations revealed a stone wall foundation, a clay floor surface and a number of pits on the S side of Cramond House. 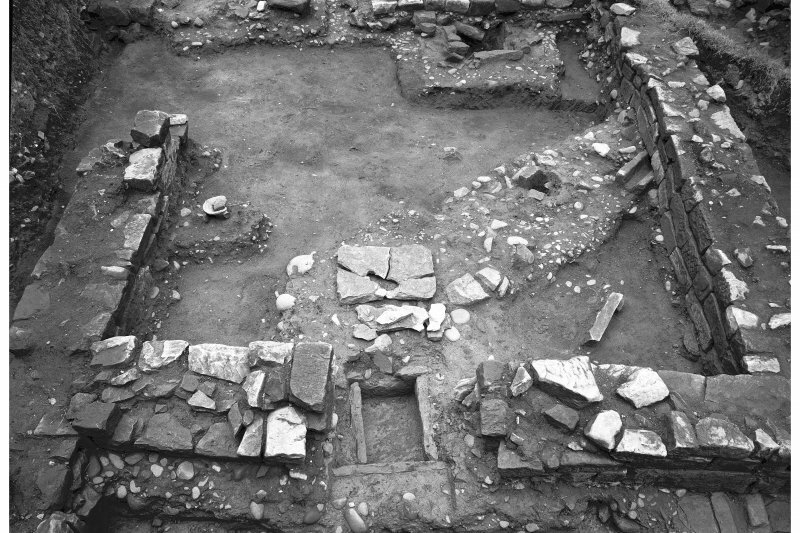 All but one pit contained exclusively Roman material. Late Roman pottery overlay the clay floor. A 15cm band of burnt daub 2m long was noted in a pit-like depression in the foundation trench for a new house, approximately 140m S of the S gate of the fort. An irregular stone spread on which Roman bootstuds were found was to the NW. Trenches dug by contractor to provide services within the area of the fort and in the vicinity of Craraond Tower have revealed clay and mortar bonded wall foundations over cobbling. Trenches machine-dug for services to Tower through grass verge on north side of drive to Cramond house revealed clay and mortar bonded wall foundations over cobbling. The surviving final line of the inscription reads: IVLIINVE; no satisfactory explanation has been offered, and the letters could be part of a secondary inscription. apparently unworked, may have come from the wall core. Britannia V (1974), 163-224; Discovery Excav Scot 1984, 14. Foundation trenches dug for the construction of a house to the SSW of 49 Crammond Glebe Road exposed part of the surface of the W interval!urn road of the Fort. Its position proved to be as on the published plan (Britannia V, 1974), and parts of its surface were covered by a layer of collapsed turf/clay from the adjacent rampart. examine and evaluate the area between the northern defences of the Roman fort and bathhouse which lie in ground owned by the City of Edinburgh Council. 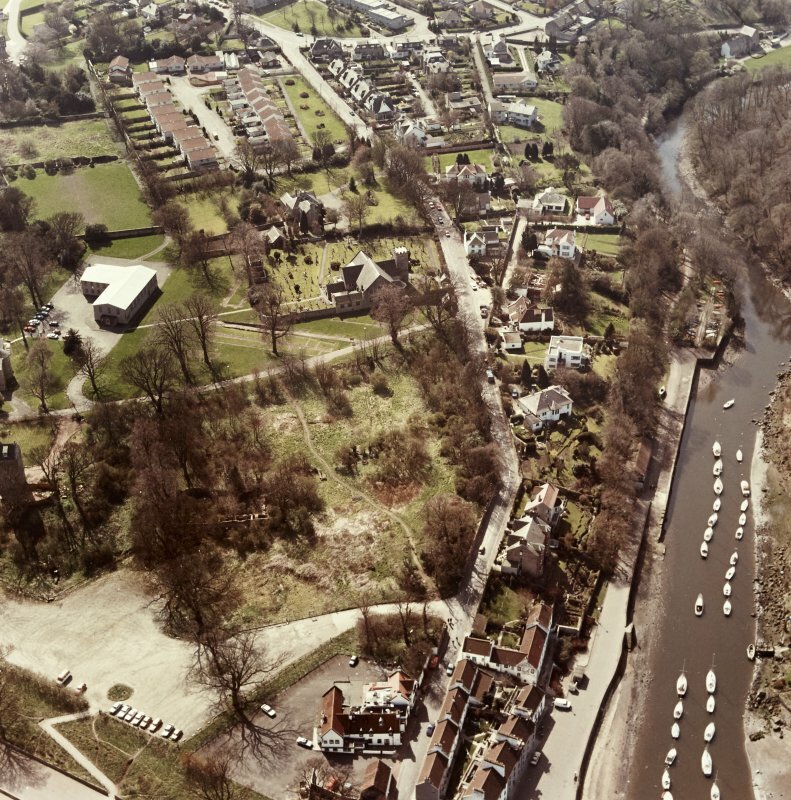 The objectives of the excavation were to: establish the existence of any Roman period deposits, structures or features; to seek traces of old Cramond village and to record the level of the old ground surface. Scheduled Area in 1998, SMC was again sought and granted. The excavation was carried between 1988 and 2001 by some 120 members of the Edinburgh Archaeological Field Society, an amateur organisation, under the overall direction of the City Archaeologist and under the immediate supervision of Valerie E Dean. As this was done on a purely voluntary basis, work normally took place only on two days per week between Easter and November. This, naturally, led to a somewhat protracted excavation. The excavation also acted as an introduction to archaeology for a large number of Society members, many of whom went on to gain further experience elsewhere. It also attracted a considerable amount of interest locally and visitors were anxious to be kept informed of developments. Edinburgh Archaeological Field Society (EAFS) conducted a geophysical survey adjacent to trenches between rampart and bathhouse. 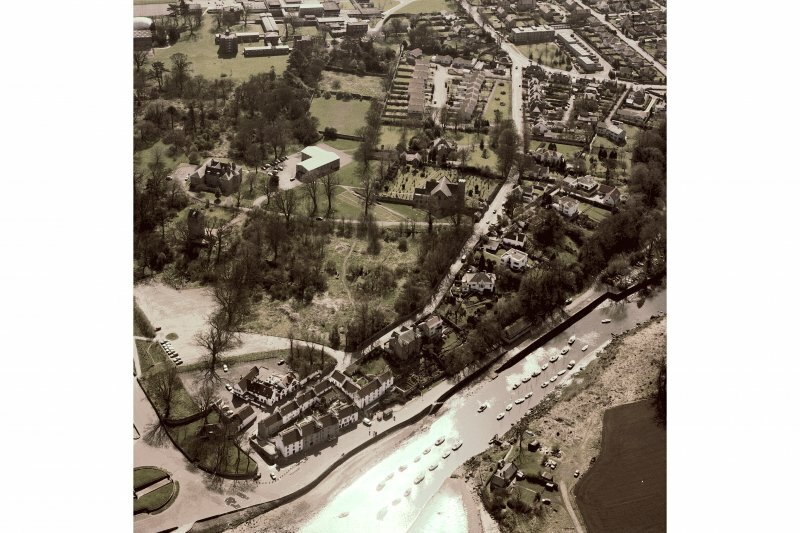 Three trial trenches were opened within the perimeter of the fort's defences in advance of the installation of a new service pipe trench to Cramond House. A watching brief was carried out during the installation of the service trench. Archaeological remains were encountered at two locations outside the fort's defences. The first of these (NT 1906 7692) consisted of an area of scorched sand approximately 4m long at a depth of 0.85m below modern ground level. No associated structure was visible within the narrow (0.40m) width of the service trench. At NT 1907 7692, a 0.40m length of wall, running N-S across the trench at a depth of c0.60m, was removed by the service trench. This wall turned a right-angle to run westwards along the S edge of the service trench. It was underlain by an earlier wall trench containing clay pipe fragments and a sherd of post-medieval pottery. In view of its close proximity, it is possible that these remains could have been associated with Cramond Tower. Sponsor: D M Hall (Chartered Surveyors). Excavation of new footings for the old mortuary house in the NW corner of the kirkyard uncovered a 5m length of Roman granary wall, a continuation of the structure excavated immediately to the N by Alan Rae (Britannia 1974). The wall had been robbed to the course above foundation level in most places. It was constructed of a mortared rubble core with squared sandstone facing blocks. The main body of the wall was 0.9m wide with a single offset foundation course projecting on both sides. Two buttresses on its E side were recognised: both had been badly damaged by robbing. A vent ran through the wall width between the buttresses. After recording the wall was reburied. NT 1899 7679. Length of curved pink sandstone, part of a stone arch, square-sectioned for half its length of 90cms. 20 by 60cms in section. Built into retaining wall adjacent to Manse basement at NW corner. Two pieces of curving pink sandstone, possibly arch or window tops, were noted built into a retaining wall at the NW of the Manse and into the W wall of the Kirk, immediately S of the tower. NT 1896 7684. Fragment of curved pink sandstone, in W wall of Kirk, immediately S of tower. Possibly part of stone arch. and Braepark was monitored, and an investigation was made of a wall foundation identified in a trench by workmen at Barnton Gardens. No features of archaeological significance were identified, although two fragments of Roman amphora were recovered from Cramond Glebe Road. Sponsor: John Kennedy (CE) Ltd.
(NT 190 769) A watching brief was undertaken in June 2003 on ground disturbance associated with the construction of a noise monitoring station at the manse, which lies within Cramond Roman fort. Excavation revealed topsoil and tarmac above modern overburden, to a maximum depth of 0.65m. Natural subsoil was not reached. Headland Archaeology Ltd was commissioned by John Lawson of Edinburgh City Council to create an Access database and GIS shape files based on a type-written database prepared by Val Dean of the Edinburgh Archaeological Field Society. Three areas centred around NT 1903 7702; NT 1902 7688 and NT 1903 7679. A programme of archaeological works was undertaken in May-June 2006 on behalf of the Cramond Management Group and the City of Edinburgh Council to inform an appropriate mitigation strategy for the future protection, conservation and interpretation of the known Roman remains and 19th-century kennels. The works consisted of evaluation trenching across the area of Cramond Roman Fort, the Roman bath-house and the 19th-century kennels. Before the trenching within the Roman fort, a geophysical survey was carried out over the area previously investigated by the Raes in the 1950s, revealing linear features thought to relate to the fort. 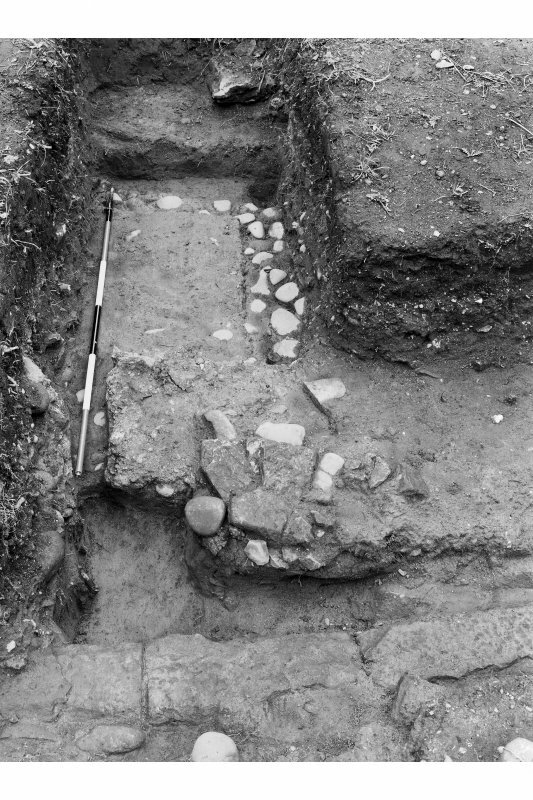 Trenching within the Roman fort identified remains associated with the latrine, barracks and principia. Test-pits were opened within the Roman bath-house in order to reveal the surviving structure for a conservation assessment to be carried out. The bath-house proved to be in good condition. Trenching within the kennels revealed a suite of post-medieval features associated with the industrial use (tanning) of the area, as well as features contemporary with the structure. A number of small finds consisting of Roman and medieval ceramics and Roman masonry were recovered from the kennels and the fort areas. An archaeological watching brief was undertaken by AOC Archaeology Group on works draining waterlogged ground within Cramond Roman Fort (NMRS: NT17NE 3.00), a Scheduled Ancient Monumnet (Index No. 2526, scheduling date 21st January 1998). The watching brief also monitored the excavation of planting holes for new trees. 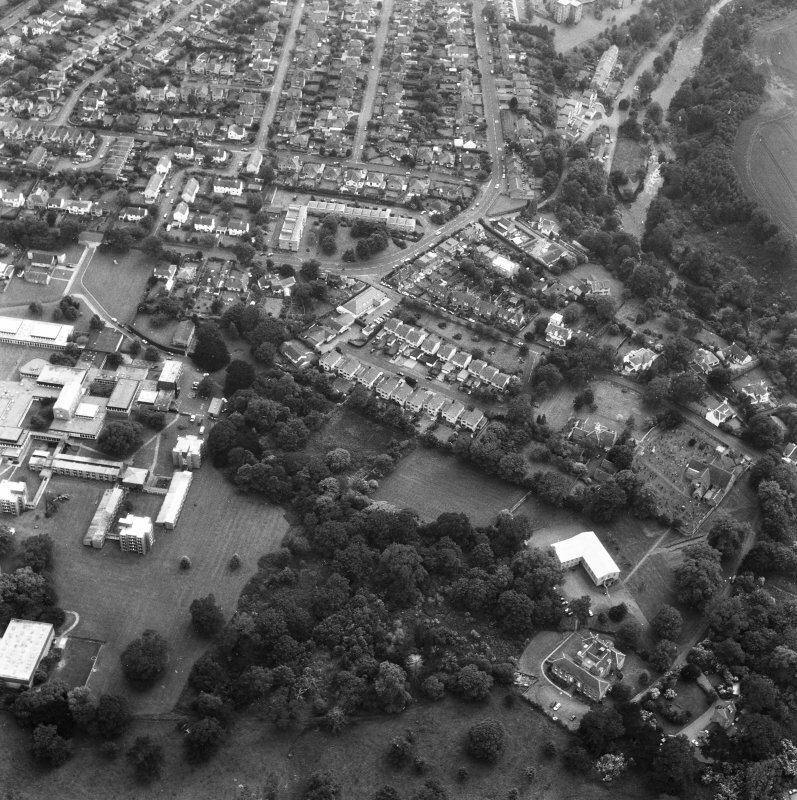 The works were commissioned as part of the Historic Crammond Management Plan, and were designed to link a drainage trench with an existing sewer situated within local authority owned ground forming part of the 18th and 19th century designed landscape associated with Cramond House (NGR: NT 1902 7688). The works consisted of 186 linear metres of drainage trench measuring 0.40m in width, of which 76m is situated outside of the scheduled area. Three carved sandstones were recovered from the Scheduled Area during the digging of the trench. These were thought to relate to either the demolition of an ornamental 18th century bridge known to exist within this location or to the demolition of the South Lodge. It is known that the demolition of this bulding is linked to the large amounts of dumped material existing within the Scheduled Area relating to the creation of Moray House College. The former 18th century drive to the Lodge was also uncovered running south-east along the current Scheduled Ancient Monument boundary. Of the 12 tree-planting holes monitored only one, Pit 12, revealed a significant find, a whetstone, at NGR: NT 1897 7694. No other significant archaeological features or artefacts were observed. NT 1909 7677 A programme of test pitting was carried out 19–20 November 2007 before the extension of a play park. The new park falls inside the SAM of Cramond Roman Fort (NT17NE 3.00). No significant archaeological features or artefacts were recorded. NT 1900 7688 Work was undertaken, August–October 2008, to enable the formulation of an appropriate mitigation strategy for the future protection, conservation and interpretation of the Roman remains. The works consisted of three elements; the excavation of the two barrack blocks and evaluations of the granary building and the eastern entrance of the Roman fort. The work was successful in identifying previously known features in Barrack Block B, but more importantly in situ deposits in Barrack block A and Trenches B and C. Fresh evidence for the phasing of the buildings was recovered and a large selection of artefacts was recovered. These included metalwork, coins and ceramics relating to the Roman occupation, and medieval ceramics and metalwork. area as a previous resistive survey (DES 2004, 53 and 2005, 63). Correlation between resistive and magnetic printouts is good, with the latter showing more fine detail. The line of the postulated upcast, ditch and wall/bank on the edge of the raised beach was confirmed. Significant anomalies to the S of this could be either Roman or garden features from the 1680 Cramond House. Some large magnetic features do not align with resistive anomalies and could represent the sites of ovens, pottery and tile kilns or forges. Area ground and linear array resistance measurements taken at four sites on the edge of the fort, 9–20 April 2009, aimed to add further information and clarification to that derived from previous surveys. A single 20 x 20m grid was surveyed on the lawn and drive to the S of the tower in an attempt to determine the continued line of the ditch detected in the pond. Low resistance on the E side of the square, next to the pond, possibly curved towards the SW corner of the square. This suggests that it may have joined the ditch on the E side of the fort. depth of about 1m. Interpretation was hampered by two low resistance robbed out walls that ran E–W and aligned with boundaries on the W side of the road. A probable old drain line ran NW across the site and obscured the point where the Via Decumana underlies the lawn. Two linear array surveys were made N–S over the edge of the raised beach 10 and 20m from the E edge of previous resistance surveys (DES 2004, 53). These aimed to clarify the line of the bank and ditch on the raised beach edge. The profiles showed two low resistances 7m apart, suggesting that the single upcast, ditch and bank previously detected 60m to the E had divided into two. The line of the more southerly is towards the Tower pond (see above); the other may follow the edge of the raised beach, to the N of the Tower and appear in section in one of the surveys in the kennels area. Three 20 x 20m grids were surveyed 8m S of the kennels with the centre line of the W pair on the line of the W wall of the kennels. Four linear array measurements were made to examine features to the N of the known position of the Severan Fort. The line of Old Street from medieval Cramond village crossed the area heading S, so any Roman features were expected to be disturbed. The W grid overlay part of trench C excavated in 1992 by EAFS. The trench appeared as an irregular high resistance infill. The adjacent printout showed only one clear feature, a comparatively modern building outline. The centre line of the third square was aligned with the E wall of the kennels. A number of amorphous high resistance anomalies could not be interpreted. Linear array 1 began 1m N of the W square NW corner; it ran parallel to trench C 2m to the W. Two, and a possible third V-shaped high resistances show at the N end of the survey area; these align with three broad shallow depressions of up to 0.4m deep found in trench C. The survey also showed, 35m to the S, a plausible wall platform with a truncated ditch at the 28m point. Linear array 2 ran down the centre line of the W pair of grids. At about its centre a complex high resistance possibly includes a truncated V-shaped ditch. Linear array 3 ran N–S on the E end of the third square starting 10m N of the NE corner. It revealed a significant V-ditch over 1m deep at the 16m point with a truncated V at 26m. If the line of the first ditch can be found it may relate to the N ditch in the parkland; it is on the edge of the raised beach. Linear array 4 ran E–W along the S side of the third square. It showed a U-shaped high resistance ditch 6m from the E end. The V shaped high resistances of linear array 1, the shallow depressions of trench C, the possible truncated V in linear array 2, and the U-shaped high resistance of linear array 4 align some 30m N of the Severan wall and are a plausible boundary of the Antonine fort. An archaeological watching brief undertaken by AOC Archaeology Group on the site of a proposed extension to an existing property at 7 The Glebe, Cramond, Edinburgh. The archaeological watching brief monitored the excavation of a single foundation pit through made ground. Neither significant archaeological features nor artefacts were encountered. monitored the excavation of seven small foundation pits for the construction of a new raised deck to the rear of the property. 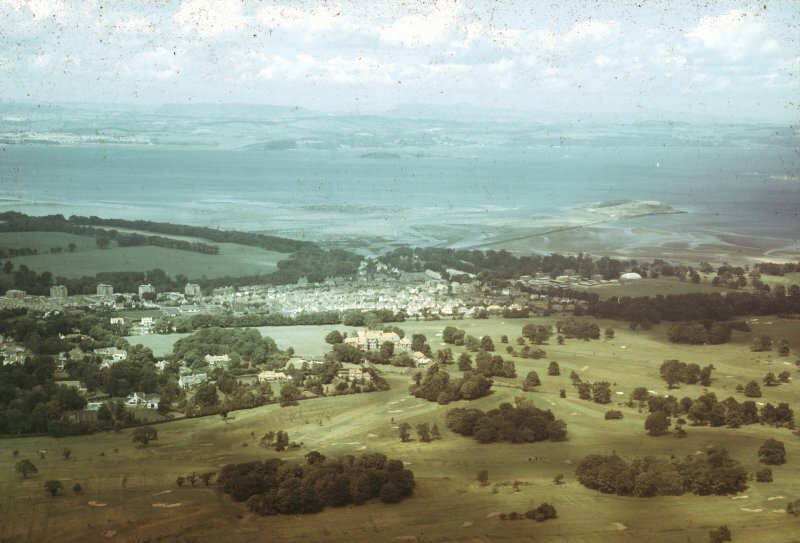 The site is located within the immediate vicinity of Cramond Roman Fort. two small fragments of post medieval ceramics. No significant archaeological deposits were encountered. NT 1895 7683 (centred on) A watching brief was undertaken, 21 August – 7 September 2017, during installation of signs and posts in the vicinity of Cramond Roman fort and bath house (NT17NE 3). NT 19048 77050 Orientation board requiring two postholes, within public car park. NT 18973 77018 Finger post requiring one posthole, at junction of footpath and entrance to public car park. NT 19006 76903 Finger post requiring one posthole, on verge adjacent to drive to Cramond House. Made up ground, no archaeology noted at any of the above locations. NT 19067 76872 Waymark post requiring one posthole, at junction of footpath from Cramond Kirk and Kirk Hall car park. Cut stone revealed, possibly from 1962 demolition of former stables. Excavation of Roman sites at Cramond, Edinburgh. Sponsors: Historic Scotland; Edinburgh City Museums and Galleries; Manpower Services Commission; Nuclear Enterprises Ltd, Edinburgh. Portions of amphora base and handle apparently found in kirkyard. Stamp reads 'III MIN/CIOR'. Stone wall and clay floor, approx 60' inside W drive of Cramond House on S side. 1629 coin in wall. House and destroyed floor of Roman storehouse. 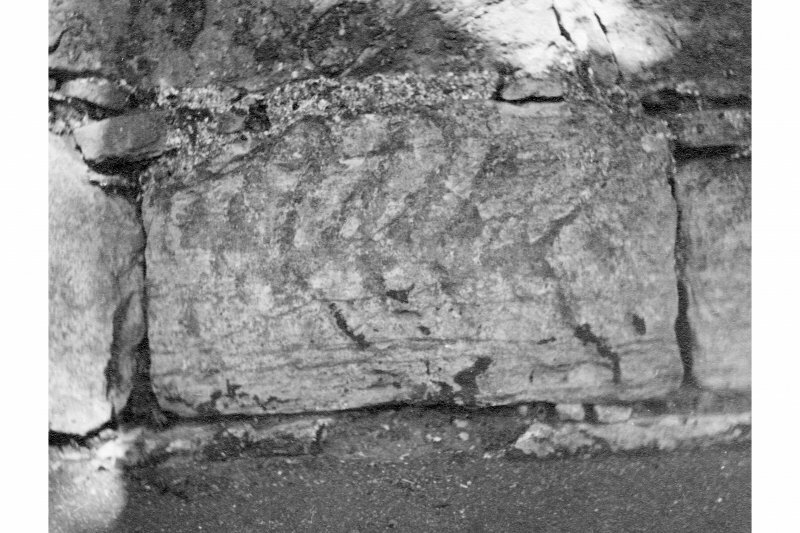 Upper portion of altar, inscription: D(EO) M(ARTI) / CON(DATI) / [… Found in outer fort ditch in manse garden].